Specialist cabinets require specialist hinges – in this case we have produced our 1069 series in both zinc plated steel and stainless steel AISI 304 designed for prominent doors (otherwise known as lay-on doors). The 1069 hinge meets production requirements for weld-on or weld-stud and nut fixing, plus its circlip retained removable hinge pin ensures easy assembly and door removal for installation or on-site working. The 1069 is concealed within a 20mm door flange return for appropriate security and aesthetics, and enables 120° of opening to provide unimpeded access even with side-by-side suites of cabinets. 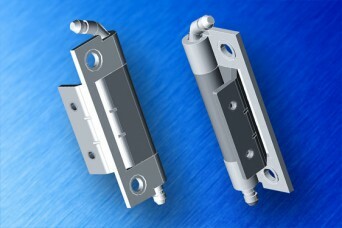 Share the post "1069 series – 120° hinges for specialist cabinets with prominent/lay-on doors"